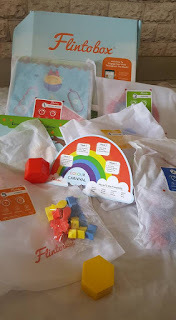 Each box is loaded with play-based activities for kids that promote early child development in a fun way. With a new theme every month, this research-based box is crafted by montessori experts and child psychologists, and caters to the 12 developmental areas of a child. I have been hearing and reading good reviews of flintobox since the time it was launched. I received the Flintobox as a token for hosting "gadgetfree bachpan" contest for which flintobox was a sponsor. Although A is little young to play meaningfully with the activity sets given, I let him engage with it the way he wants and he thouroughly seemed to enjoy exploring the activities. Each box comes with 3- 5 activity bags based on one particular theme. Colour Carnival was the theme for our box. Bag 1. 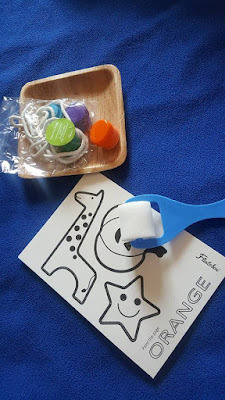 Had a colorful shape sorting and number matching puzzle and a book. Bag 3. Had colour rings/shape sorter, that were to be put together- one within the other. Helping the child understand colours, shapes and concept of big and small. Bag 4. Had faber castell paints. Rolling brush and sheets that needed to be painted. Bag 5. Came with tiny fishes of different colours, a tong and 3 colourful small containers. The child is required to sort fishes as per the color in these containers. Activity aims at improving hand and eye coordonation, fine motor skills and can easily engage the child for 20-25 minutes. The packaging is really good. I also liked the finishing and quality of each item in the bags. Their back-end support is commendable. From the time you book your subscription to the time it is delivered, there is a timely update on your order, and queries are handled quite efficiently. You not only receive an activity box, but also daily e-mails of interesting DIY activities that you could do with your kids. I loved the Flintobox so much that I ordered a 3 months' subscription for my nephew, couldn't let go off the Super saver Navratri offer. Waiting for A to grow up a bit to learn the fun way with flintobox. The experience shared here is my own and is not influenced by the brand in any way. That's an interesting theme. Flintobox definitely has well thought about activities. Flintobox games n toys are very innovative. We are always eager to open it. Flintobox comes in with some exciting toys for kids! Flintobox has been our all time favourite box...with so many activities they have an amazing box in stored with learning, creativity etc. Wow! I have bought this once and love the creativity that goes in the making. Thank you for this detailed review. I wish I was a kid and I could have got the chance to use them too. I so much need to agree that my son loves his flintobox like anything, and his skills have taken a shape since he started doing them. Flintoboxes Are Really Fun and Meaningful..I loved your Honest Reviews.